The French company Focal are primarily known as speaker makers – but at the moment, they are enormously keen to get the word out about their headphones. We know this because they have sent us a good five or six different models over the past few months, ranging from the good (Spark) to the absolutely spectacular (Utopia). Where does the $219 Listen Wireless fall on that spectrum? Somewhere in the middle. In this review, we break down the Listen Wireless’s design, comfort and fit, sound, packaging and accessories, specs and more, as well as how they compare to other models. You can also check out our video review. 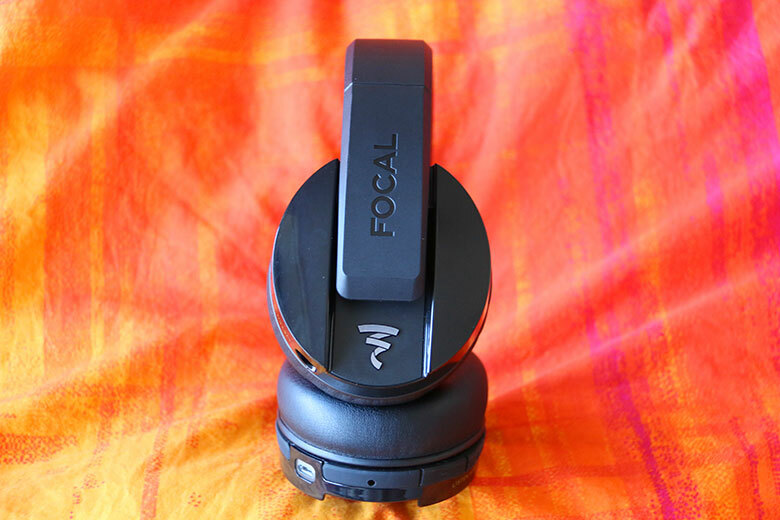 Focal’s headphones often share the same DNA – just take a look at the Elear and the more expensive Clear, which not only have virtually identical names, but extremely similar design. Given where their aesthetic has taken them, the Focal Listen Wireless almost feels like a throwback. The finish of the plastic housing is a combination of matte and gloss, and the inside cups are made of soft, squidgy memory foam. Although you only get one color option (black), it’s an attractive one, and elements like the shiny metal logos on the outside of the cups and the bright red inners make these one of the better looking headphones in this particular price range. In terms of wireless headphones, they are attractive without being flashy, and definitely look a little bit more expensive than they are – quite an achievement, given the build materials. However, where the Listen Wireless hit a home run with their overall design aesthetic, they lose out big time on the control scheme. It’s separated into two discrete sections: an on/off switch, volume controls, and Bluetooth pairing button on one housing, and track controls on the other. The former works fine – very well, in fact, with the switch proving both useful and intuitive. Power switches aren’t always a given with wireless headphones, which often use their Bluetooth button to turn the cans on, which can lead to some annoying situations. Not here. Ditto for the rubbery volume buttons, which work just fine. However, the track control buttons pose a problem. Namely: there are too many of them. We don’t need three separate buttons to handle call answering/ending, fast forward, back track, play and pause. We need exactly one. A single button with multi-click functionality has been an industry standard for years now, and it’s exceptionally annoying to see companies try to reinvent this. Especially since, in the heat of the moment, you’re likely to get a little bit forgetful and accidentally skip a track when all you are trying to do is raise the volume. An easy mistake to make, given that on most headphones, the volume buttons on either side of the track control button. It is deeply annoying that a company normally so good at the details has flubbed this one. It’s not a deal breaker, but it’s worth bearing in mind. The headphones are pretty portable, which is par for the course with wireless models. They hinge just above the cups, and are light enough (10.6oz) and robust enough that you can quite happily drop them into a bag, or shove them into the pocket of the coat. All the same, you won’t have an issue hanging these around your neck, if that’s your preferred method of toting cans around. Battery life, when we tested it, was very good. Focal advertise up to twenty hours of listening, and we got close to that, hitting eighteen hours at a moderate volume before requiring a charge. That’s enough for all but the longest trips, and is a nice checkmark in the Positives box for these headphones. Another issue: the clamping pressure. Focal have always had headphones that sits securely on the skull. In almost all their other models, they got the pressure spot on. Here, it’s just a little too tight for comfort. While we didn’t experience any issues while wearing them for long periods, the sheer force with which the headphones clamped onto the head means that anybody even a little bit sensitive to this might experience problems. Definitely worth bearing in mind, if that’s you. Beyond that, we experience any problems with comfort or fit. The memory foam cups worked well, sitting around that year and providing good isolation, while never becoming too uncomfortable. The headband felt good, too, with decent overall flexion. While these are quite some way from the luxurious lambskin leather of the Focal Utopia (full review here) they give a decent account of themselves, and are just as comfortable (clamping pressure aside) as any other headphones in this particular price bracket. For a pair of $200 headphones, the Listen Wireless sound good. Really good. Not audiophile-level-good, but certainly enough to separate themselves from the competition. That’s hardly surprising – this is a company, after all, that quite literally created the best headphones on Earth – but it’s still good to hear. No matter what kind of music you like, you’re going to really enjoy the Listen Wireless. The overall sound quality is rich, dark and dense, like a particularly toothsome chocolate brownie. By this, we don’t mean that it is biased towards the low end, or that it lacks high in detail. It’s just that there’s a sense of fullness, a sense of depth to the sound that other headphones simply don’t have. The 40mm electrodynamic mylar titanium drivers really helped round off the harsh edges of the sound, turning these into a fatigue free listen that will keep you happy for hours on end. We think this is helped along by the fact that the memory foam ear pads provide excellent isolation, meaning there’s almost no chance of outside noise interfering with things. But even setting that aside, it’s quite remarkable just how good these sound.It’s the mids where you notice the quality the most; things like vocals sound beautifully warm, textured and detailed, while percussion and guitar is really make an impression. Sonically, they reminded us of the very good Parrot Zik 3 headphones (full review here) – although those are quite old now, and only offer Bluetooth 3.0 to the Listen Wireless’s 4.1. Nevertheless, the sound signature is very similar. Call quality, when we tested it, was perfectly acceptable. Although generally, you have to work pretty hard to screw this up with wireless headphones, as the standard these days is very high indeed. The Listen Wireless has two omnidirectional microphones embedded in the housing, and they never had an issue picking up our voice. Listening to the headphones in wired mode didn’t provide a huge change in sound quality, although of course that approach will save the battery. Whatever design flaws they may have, there’s no question that the Listen Wireless was made by the same people who created the Utopia. The technology and materials are cheaper, but the tuning expertise is definitely there. Focal always do a good job with their accessories, and there’s no exception here. Although the packaging is nothing to write home about – a simple cardboard box, with the headphones nestled in a shaped insert – we do think the accessories are rather attractive. Chief among these is a simple neoprene pouch, which is nicely stretchy, and provides enough room for the headphones as well as any cables you have. And speaking of cables, there are no surprises here. You get a USB charging cable (charging time, for what it’s worth, was no more than a couple of hours) and a simple 3.5mm cable for when you want to save the battery. Again: nothing we didn’t expect, and nothing missing, either. While the neoprene pouch isn’t quite as cool as the tough fabric of the Focal Clear carry case, it certainly gets the job done – and you’re not going to be devastated if you lose it. The charging cable is micro-USB, too, meaning that even if you lose that, almost certainly have a compatible cable knocking around. Despite the clumsiness with the controls, which we still found annoying even after using the headphones for a few weeks, we really like the Listen Wireless. Largely, that’s to do with the sound, which is far better than the price point would suggest. It’s audio signature that we found addictive, and that which particularly sang with genres like hip-hop and soul. Compared to other models in this price range, like the aforementioned Parrot Zik 3 as well as headphones like the Klipsch Reference, these cans perform very well indeed. They don’t have one key feature that elevates them to true greatness. While we think they absolutely deserve a place on our list of the best wireless headphones, they don’t do it because they completely blew our minds. They do it because they do almost everything well, and some things very well. If what you’re looking for is a good, competent pair of headphones from a reliable name, that will give you excellent sound quality, and you want to concerned about the design issues we mentioned, then we strongly recommend these. They are a lot of fun. Good build quality and materials. Clamping pressure could cause problems. We really, really like these headphones. We think that, in terms of value, they are among the best out there. Unlike the Listen Wireless, they really do have a unique selling point: the ability to customise the sound based on the interior of your ear canal, a feature that works relatively well. We do have to say that we think the Listen Wireless do sound a bit better, especially in the vocals, which the Earprint sometimes struggle with. All the same, if you’re looking for something different – and like the wood effect on the cups – then you should absolutely check out EVEN’s baby. These are a wonderful alternative to the Listen Wireless - albeit a much more expensive one. If you’re prepared to tote around the version with rose gold hinges, you can even have aptX functionality. We’ve spent a month with these, and will be publishing a full review soon. The sound, when compared to the Focals, is definitely a little bit more heavy on the low end, revelling in its party-friendly nature. We think the Focals better, but these are definitely more fabulous. You know, we still catch ourselves sometimes, whenever we see these, thinking, “Klipsch make headphones?” While both they and Focal are known for their excellent speaker systems, only the latter has been able to create headphones that have really struck a chord with listeners. So far, Klipsch’s marketing and design just isn’t quite there – although it must be said, these headphones are very, very good, despite the dull name. As that name suggests, they offer sound that is refined, clear, and elegant, with the goal of making sure you get as much fidelity in your music as possible. They are perhaps a little bit cheaper than the Focals (although it pays to shop around if they aren’t) and although the design isn’t quite as good, it’s still pretty solid.